Radiant cooling on the ceiling with Ray Magic Beams panels (1/4″ gypsum board) cut to size to perfectly fit between ceiling joists. The radiant gypsum panels are then covered with tongue & groove Cedar wood planks. 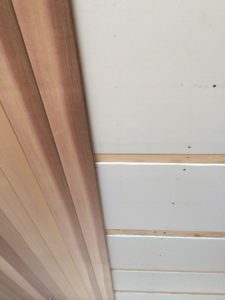 To improve cooling and heating performances, also a hydronic radiant floor has been installed: staple-up on the subfloor covered by the same tongue & groove cedar wood boards directly attached on the subfloor. The house also features two NTD200 units (Neutral Temperature Dehumidifier) combined with a HRV200 unit (Heat Recovery Ventilation) for Indoor Air Quality and comfort. This innovative air system, specifically designed for radiant cooling, allows to effectively control the relative humidity throughout the small ducts of the mechanical ventilation. The room features an ultra-modern wooden ceiling and floor that elevates the design of the whole house interior and without compromising the comfort and Thermal Wellbeing typical of a Messana radiant cooling system. 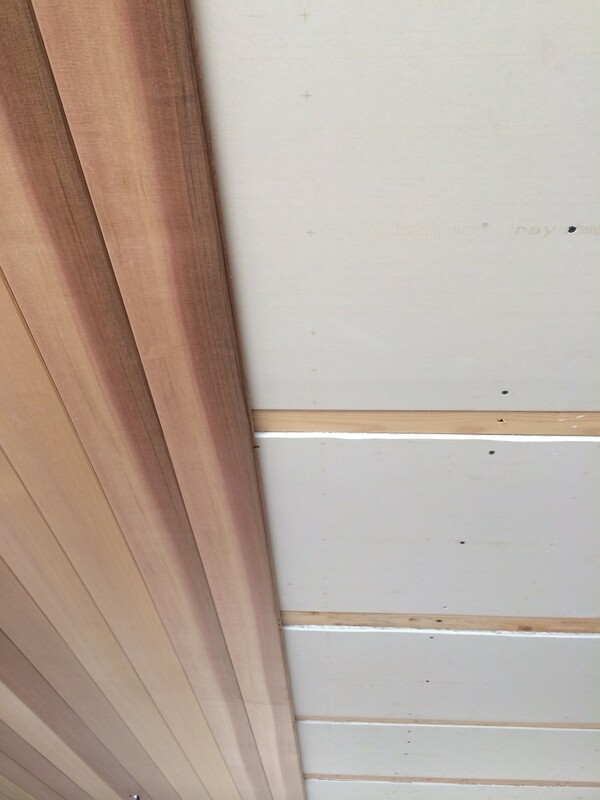 The picture shows the cedar wood ceiling planks during installation.